Lyme disease is a chronic infection caused by Borrelia burgdorferi. Similarly to many chronic infections, the natural cycle of Lyme disease is characterized by periods of exacerbation and remission. 1. Does the patient have Lyme disease? 2. Is the patient dealing with an exacerbation of Lyme disease or is the disease in its dormant state? The laboratory diagnosis of acute Lyme disease (within several days up to 3-4 weeks from the tick bite) is typically based on the detection of microorganisms, their antigens or nucleic acids in the tissues. For example: skin and biological fluids, blood, cerebrospinal fluid, synovial fluid, saliva and urine, as well as detection of Borrelia specific IgM antibodies in the blood. Diagnosing chronic Lyme disease requires a different diagnostic route. Typically, the presence of chronic Lyme disease is confirmed by a Lyme Western blot blood test. Proteins extracted from Borrelia burgdorferi microbial cells are separated in gel strips where they form protein bands. Subsequently, the patient’s blood is applied to the strips. If the patient’s blood contain antibodies to Borrelia burgdorferi, they react with the bands in the gel forming so called “positive bands”. These bands can be formed by either IgM or IgG antibodies. In patients with an inconclusive Lyme Western blot test result, another approach can be used. In our clinic we call it ‘band shift’. Let’s presume that a patient with a clinical picture suspicious for Lyme disease has only one or may have several bands in Lyme Western blot, but are not the most unique or specific for Borrelia burgdorferi. In this situation we ask the patient to take an antibiotic or anti-microbial herb for 1-2 months with a repeat of the Western blot test. If there is a change in the band profile this is typically indicative for the presence of the disease. Taking an antibiotic or anti-microbial kills the Borrelia pathogen and releases toxins into your bloodstream. In response to the release of toxins, your antibodies increase resulting in the band shift. The Western Blot test measures for levels of antibodies to the Borrelia, not the Borrelia itself. The interpretation of Lyme Western blot in patients with chronic Lyme disease can be misleading if it is performed by a person with insufficient knowledge of infectious immunology. In addition, quite frequently the rules of vaccine immunology are blindly transferred into the area of immunology of chronic infections that also result in misinterpretation of the actual results. The test systems on the market are not standardized. Therefore, findings from different laboratories can be compared only to a limited degree. At IFSMED we also perform Lyme Western blot on synovial fluid (fluid aspirated from swollen joints). Our joints and synovial spaces represent biological traps for various microbial antigens which stimulate a local intrasynovial immune response. Based on that principle, synovial fluid analysis should produce more positive results than the correspondent serum analysis. Accordingly, based on our own statistics, patients with Lyme disease have more positive bands upon analysis of synovial fluid as compared to the paired serum samples. The image below is an example of a blood and synovial test done at the same time on the same patient. 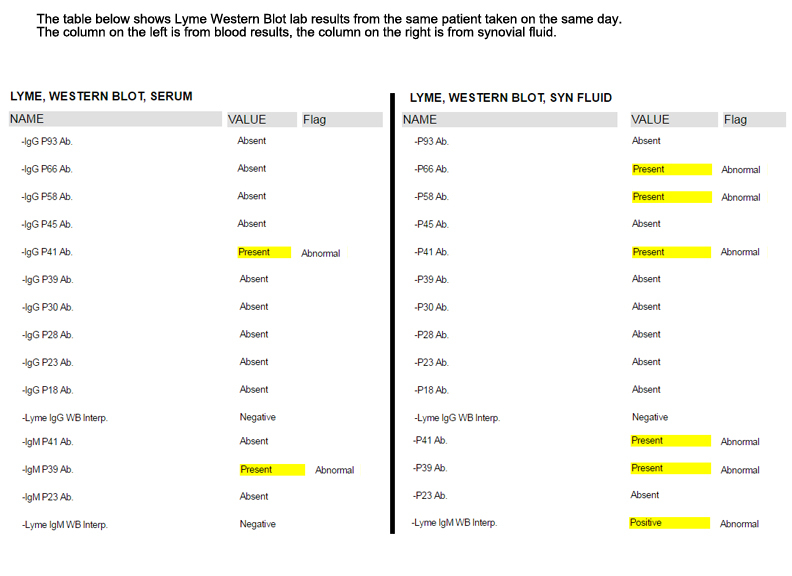 Below, please find a table explaining the specificity of various bands in Lyme Western blot. The table was published by the German Borreliosis Society. In general, the presence of either IgG or IgM antibodies to the highly specific/unique Borrelia burgdorferi proteins is indicative for Lyme disease. In patients with chronic Lyme disease, the presence of IgM antibodies may be indicative for either long-term persistence of low-affinity antibodies due to certain genetic defects in the IgM/IgG switch or the reactivation of dormant Lyme disease. A negative serological (blood) finding does not rule out Lyme borreliosis. There may be a disease requiring treatment even without the detection of antibodies. A positive Lyme Western blot means that the patient has acquired a Borrelia infection at some point in time. With a single blood test it is not possible to decide whether this infection is active or dormant. C4a: complement component C4a is known as anaphylatoxin. It serves as a mediator of local inflammatory process. It induces the contraction of smooth muscle, increases vascular permeability and causes histamine release from mast cells and basophilic leukocytes. Patients with active Lyme disease are characterized by the increased blood levels of C4a. CD57: a marker of natural killer (NK) cells. CD57 expression defines functionally discrete sub-populations of NK cells. CD57 expression seems to identify the final stages of peripheral NK cell maturation; its expression increases with age and is associated with chronic viral infections, particularly human cytomegalovirus infection. Patients with chronic Lyme disease are characterized by low count of CD57+ NK cells in peripheral blood. Immune complexes: an immune complex, sometimes called an antigen-antibody complex, is a molecule formed from the integral binding of an antibody to a soluble antigen. The increased blood concentration of immune complexes is found in patients with various chronic infections, including Lyme disease, as well as in patients with certain autoimmune disease, for example, systemic lupus erythematosis. 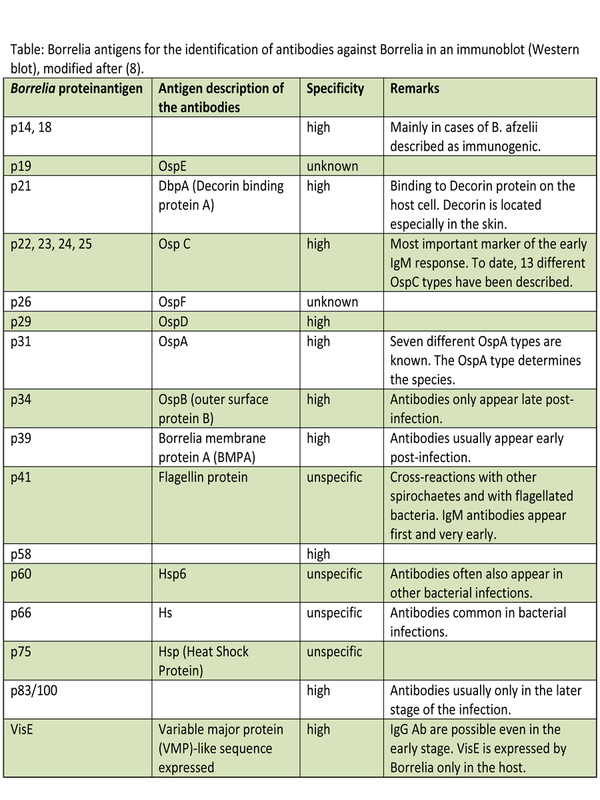 IgM antibodies to phospholipids (APL antibodies): the presence of low affinity IgM APL antibodies is seen in various chronic infections, including chronic Lyme disease. In contrast to blood-clot inducing IgG APL antibodies, the functional/pathological significance of IgM APL antibodies is unclear. Anti-histone and anti-chromatin antibodies: autoantibodies frequently found in patients with autoimmune and chronic infectious diseases, including Lyme disease. Most likely, the level of these antibodies parallels the concentration of immune complexes. None of the above markers are unique for Lyme disease. However, taken together with clinical symptoms and Lyme Western blot results they can be used as surrogate markers of the disease activity. Furthermore, these markers can be used to monitor the outcome of the anti-microbial therapy in patients with Lyme disease.